Low and fast over the jungle of Viet-Nam, an animal appears from the smoke, destroying anything in its path. 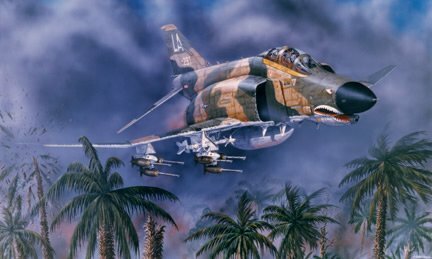 This "Animal" is 69-291, an F-4E Phantom from the 4th TPS, 366th TFW. Flying on the deck to avoid SAM missles and following his wingman down low on their bombing run, the pilot presses thru the smoke and debris from exploding bombs, while the RIO notices palm trees are exploding after being hit by the right wing. This brute of an aircraft however, can handle the punishment and is ready to dish out more. Aircraft 291, was flown by Captains Sam White and Frank Bettine of the 4th Tactical Fighter Squadron (TFS), 366th Tactical Fighter Wing.